Medieval costumes are fun and popular for plays, costume parties and for Halloween. While you can purchase the costume online, you can actually make the costume yourself from items you may have in your closet. Here is how to make a Medieval Costume from clothes in your closet. Choose a poet shirt with angel sleeves or puffy sleeves. It is preferable to use one with a tie up or stretch neckline that can also be worn off the shoulders. Choose a full length dress. It can be stretch knit or velvet. It can be slim fit with an a-line skirt or empire waist. It should have short puffy sleeves or no sleeves. Put the long dress over the poet shirt for a full medieval look. You will see that your costume is beginning to form. Use the gold braid trim to embellish the costume. 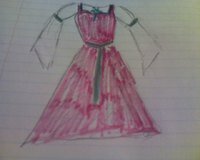 Put it on the neckline of the dress, and also at the waist. If you are using an empire waist dress, put the trim under the bust. If you are using a dress with a slim fit make a low slung belt with long tail that hangs down the front. Also make arm bands to use wear above the elbows to puff the sleeve around. If you are not attached to the dress and are willing to alter it permanently, you can cut the skirt section up the center front and put a second colorful skirt underneath. What Costume Can I Make With a Graduation Gown?